Dr. Robert M. Collett, founder of Designing Health, grew up in Colorado where his love of animals started at a very young age. His passion for animals and their health led him to study veterinary medicine at Colorado State University. After graduation, Dr. Collett moved to Southern California and over the next 40 plus years he developed one of the most successful practices in the Western States. He spent a decade researching and then testing countless formulations before finalizing to the current Missing Link formulations. Due to the rigorous ingredient quality control and proprietary production process; a production facility was established in Valencia CA. The Valencia, CA facility is USDA and FDA Registered and produces all of the Missing Link Branded items. Maximum potency is achieved via using the highest premium quality ingredients and then processing through a proprietary / patented cold process. The Missing Link® Canine Ultimate Hip and Joint Formula (Formerly Missing Link Canine Plus Formula) features a unique blend of glucosamine hydrochloride, omega 3 and 6 fatty acids, and rich whole foods and food concentrates to provide the ultimate in joint support in combination with great nutrition. 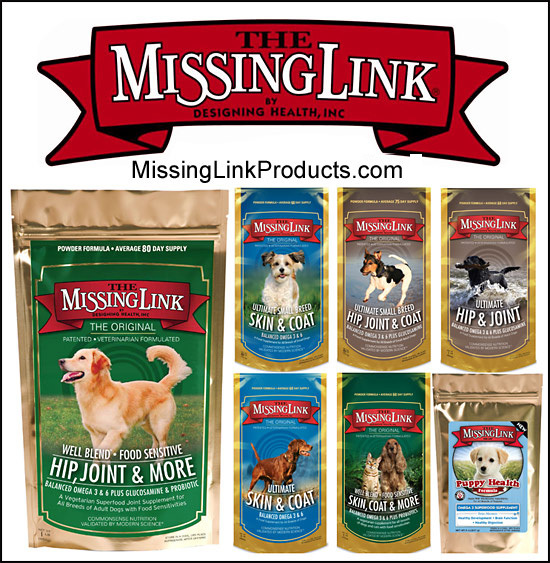 Our Missing Link® Canine Ultimate Hip and Joint Formula combines the benefits of GLUCOSAMINE with natural, quality whole foods, carefully chosen for their nutrient profile and synergistic effects. The product is in the form of a granular powder that is easily sprinkled on the animal's regular food on a daily basis according to weight. This is a great and affordable product for mature and older dogs who may be starting to show stiffness, lameness, or arthritic joint pain. Glucosamine HCl to stimulate the production of collagen, the protein that helps support healthy joints. Omega 3 and 6 fatty acids to reduce inflammation and promote joint mobility, a healthy skin and coat and balanced energy. Fiber for bowel health and to help maintain normal digestion. Phyto (plant) nutrients and traces of various vitamins and minerals important for overall health and well being. In nature, animals consume foods that are whole, raw and fresh, while domestic animals generally have a diet of processed foods only. The Missing Link® Canine Ultimate Skin and Coat Formula (Formerly Missing Link Canine Formula) was developed to target the nutritional gap between what nature provides and what is available in commercial foods. Formulated with natural, quality whole foods and food concentrates, The Missing Link® Canine Ultimate Skin and Coat reintroduces unprocessed, nutrient-rich foods into your animal's diet. After weaning, just sprinkle the recommended amount on your puppy's food each day. After 9-12 months, continue supplementation with The Missing Link® Canine Ultimate Skin and Coat Formula to help maintain vitality, healthy skin, and a beautiful shiny coat. Adding Superfood supplements to puppy food is a convenient way to provide proper puppy nutrition, followed by The Missing Link® Canine Ultimate Skin and Coat Formula The Missing Link® Canine Ultimate Skin and Coat Formula for optimum dog nutrition. The Missing Link Well Blend Plus® Food Sensitive with Probiotics is an all-vegetarian formula which also features a unique blend of glucosamine hydrochloride, Omega 3 and 6 Essential Fatty Acids, and rich whole foods and food concentrates to provide the ultimate in joint support in combination with great nutrition. Our Plus formula combines the benefits of glucosamine with natural, quality whole foods, carefully chosen for their nutrient profile and synergistic effects. The product is in the form of a granular powder that is easily sprinkled on the animal's regular food on a daily basis according to weight. This is a great and affordable product for mature and older dogs who are sensitive to meat proteins and may be starting to show stiffness, lameness, or arthritic joint pain. Probiotics and Fiber for bowel health and to help maintain normal digestion. Phyto (plant) nutrients and traces of various vitamins and minerals important for overall health and wellbeing. Find The Missing Link Dealer Nearest You! Our Store Locator is available to help you and manystores carry our products for your convenience! Your canine depends upon you for good nutrition. You can ensure he received the best, most complete nutrition possible by adding the Missing Link Products to his diet!